Here is Sarawak, Malaysia on Borneo island, where we stayed for a month after travelling in Peninsular Malaysia. We based ourselves in the main city of Kuching, a very cool city, relaxed and smiles aplenty from everyone. We made a lot of friends here, both straight, gay, Muslim, Chinese origin – all very accepting and welcoming. 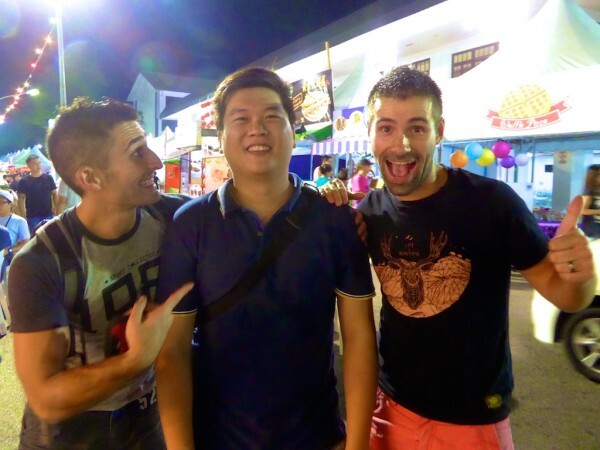 One particular friend was local metrosexual journalist, Ronnie, who guided us through the ins and outs of this part of Borneo island in our guide to gay Kuching. #2 What’s the perception of the LGBTQ community in Malaysia and Kuching? #3 Do you have any gay friends who’ve experienced any open homophobia by their friends, family or in the workplace? #4 Are there any gay bars in Kuching? #5 Are there any gay friendly hotels in Kuching? 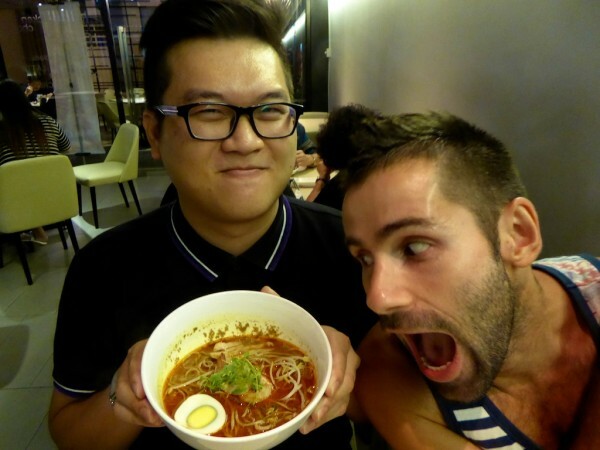 #6 What fun activities do you recommend to LGBT tourists in Kuching? 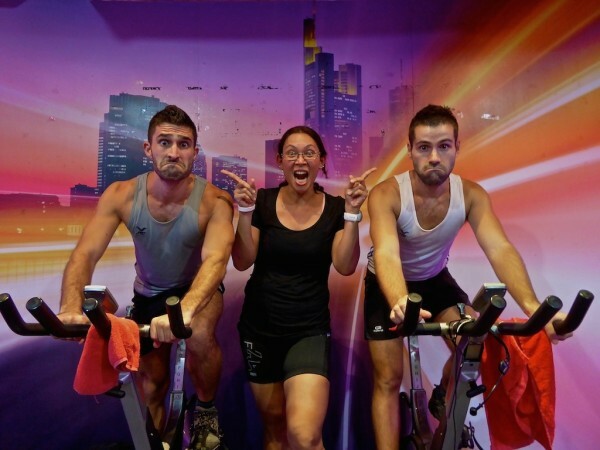 #7 Any gyms you recommend to LGBT travellers? #8 Any tips for getting up close to the proboscis monkeys and orang-utans? 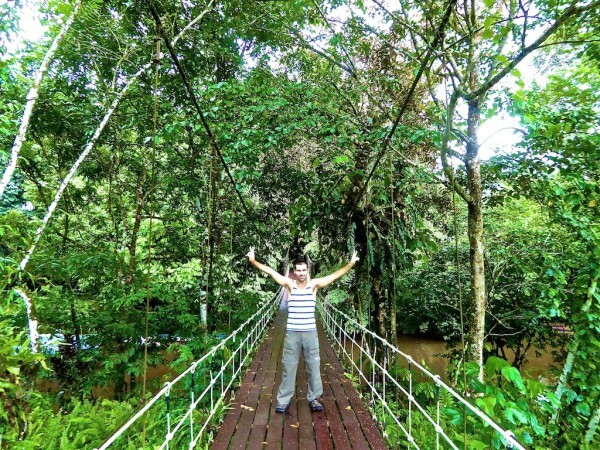 #9 Where's the best place to experience the rainforest near Kuching? 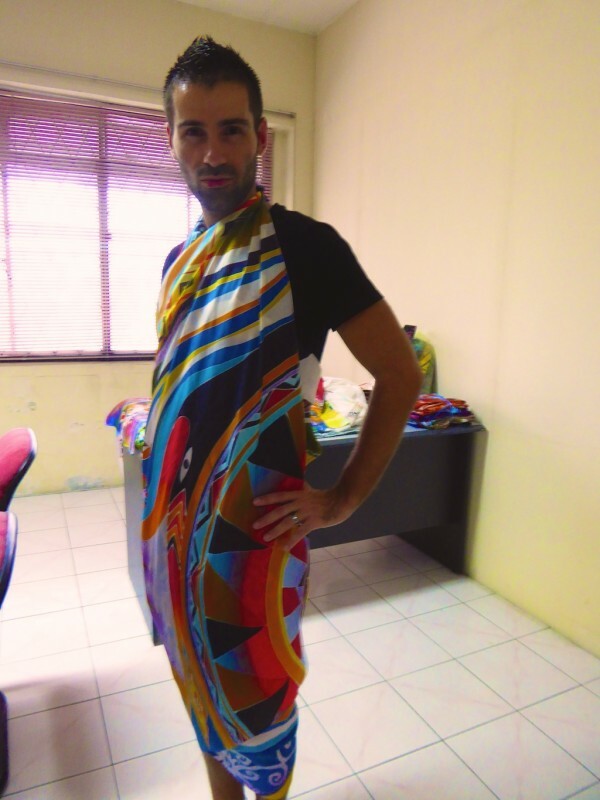 #10 Finally, Sebastien would like to invest in a new outfit for next year's Rainforest World Music Festival, any suggestions? Selamat detang to Kuching my Nomadic Baes! I am Ronnie, journalist and fellow blogger of Man in the Face Mask. Malaysia is a very conservative society, but we have a large gay community in the big cities, especially Kuala Lumpur. It's not as active as Thailand, but at least there are places you can go. Malaysia is such a hodgepodge of races and religions and that's exacerbated here in Sarawak with indigenous races like the Dayak, which can further be broken down to more than 200 ethnic subgroups! So, there are many criteria that differentiates all of us anyway. Somewhere along the way, sexual orientation becomes one of those “check-boxes”. People around here have gotten to know about gays and lesbians, but that does not necessarily translate into acceptance. Nevertheless, people rarely resort to hatred or violence on the topic. I guess it comes as no surprise why Kuching was pegged as the City of Unity a couple of months ago. And I think tourists who come here feel it too. Smiles and greetings of welcome come easily from us. Luckily boys I don't. Many people here practice the ideology of an “open secret”: it’s not really talked about in public discussions. Along this line, not many are really open about their sexuality. Nevertheless, sexuality isn't the only factor that makes up a person, and that's why homophobia is not prevalent here. We're so much more than just a straight/gay/bi label. Sarawakians are people with plenty of talent, like Ms Pandalela Rinong, 22, becoming the first female Malaysian athlete to win a medal at the Olympics, or fellow Sarawakian Miss Malaysia World 2014, Dewi Liana Seriestha, being crowned Miss World Talent last year. Zinc Bar at 38 Tabuan Road is a popular high end French / Malay fusion hang out. 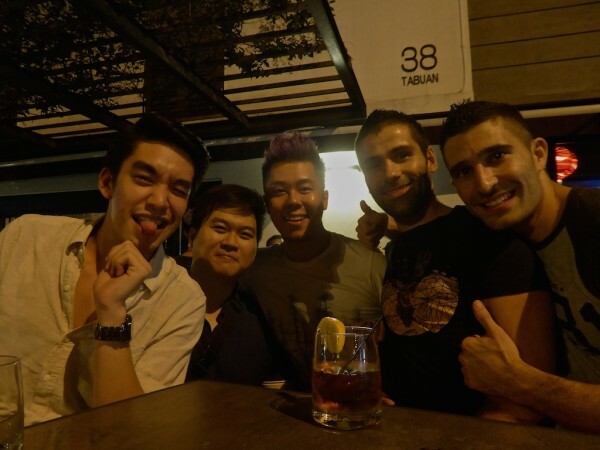 For a larger party gay scene, we head to Bangkok, Singapore and even Australia. Cute little boutique hotel with clean and comfortable rooms. Rooms start from 300 Ringgits (£46/$70) a night. Located on the river, perfect for walks and evening market. Excellent breakfast (you must try their Laksa Sarawak). Rooms from 230 Ringgits (£36/$54) a night. Good budget option with extremely friendly owners devoted to their guests. 60 Ringgits (£10/$14) a night includes a basic breakfast. 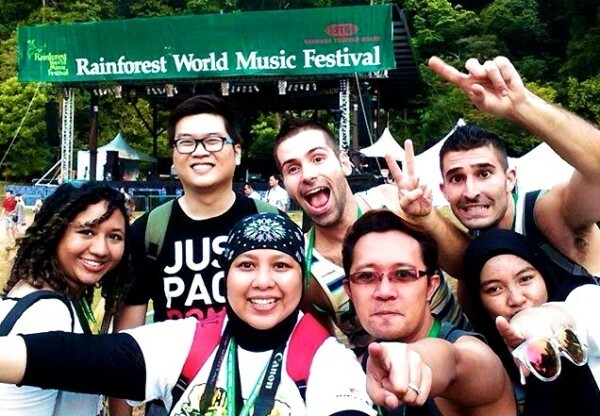 RWMF: every summer we have the awesome Rainforest World Music Festival, which attracts a mixed crowd from all over the world. Cats: we have a thing with cats and the name Kuching even means “cats” in Malay. We have a cat statue which welcomes you into the city and also a museum just about cats! Orchid garden: I love the relaxing serene atmosphere here. It's located near the Cat Museum, so the two tie in nicely for a day trip. Food: if you love your food, then you will do very well in Kuching. Everyone here is excited to show off our local specialties and every August we have the Kuching Food Festival for the entire month. Bako National Park: the place to come to see proboscis monkeys. It is located on an island, which you reach via a car ride and boat transfer. I recommend using a well reputed and gay friendly tour company like Borneo Adventures. Semenggoh Wildlife Centre: the place to see orang utans close up. This is the largest orang-utan rehabilitation centre. 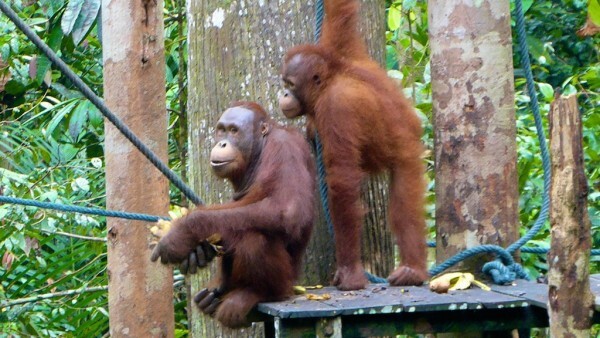 It was established in 1975 as a sanctuary for injured and orphaned orang-utans. You can visit as a day trip by yourself or arrange a tour with a company like Rainforest Kayaking, which will also include some awesome kayaking in the Borneo jungle. Mulu National Park is the place to go to experience the Borneo rainforest. It's a short flight away from Kuching. Hey boys, next time you are in Kuching, do visit my NGO. We are an HIV/AIDS NGO and deal with PLHIV. But we are also dealing directly with LGBTQ community here in Kuching. Please come to Kuching,Sarawak in Malaysia again.My name is Stanley. I really want to meet both of you so badly.My name is Stanley Sentu.I am 23 years old.I am taking a Bachelor programme in Kuching,Sarawak in Malaysia.I really want to meet both of you and have a chit chat together. Will you be coming back to Kuching,Sarawak? Ok.Please come to Kuching,Sarawak again.I really want to meet both of you. It’s good to see that other cultures are opening their minds to different lifestyles. I bet you guide was surprised at some of your questions! Such a lovely pink hat! Kuching sounds like a great place to base yourself 8n the area. I like a more relaxed and friendly vibe. The outdoor adventures look amazing, and so does the food! It looks like you had a fantastic time in Kuching, and that you were able to meet a lot of friendly and open people. I’m happy for you! Now kuching looks like a fun place. Glad you guys got to explore and meet some super cool people! 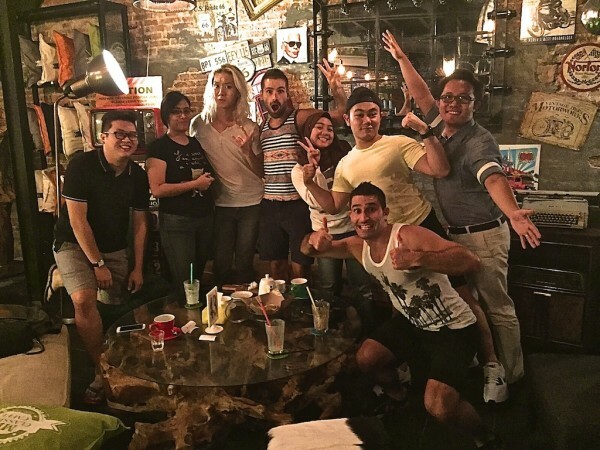 Looks like you guys had a blast in Kuching – and glad to hear you found some cool people to hang out with. I’m just over the causeway in Sing, but I still haven’t made it over there. Soon! PS – the food looks delicious! You two are total cuties and look like you have a blast anywhere you go. The Bako National Park and Orchid Garden look like a great place to visit! Everyone looks like they had an amazing trip. I really want to see orang-utans! And visit the cat museum. That looks like a bizarrely fascinating place to visit. Great guide to kuching!